Human hair extensions are beauty products that are used to lengthen or thicken the hair. There are a number of kinds of hair extensions on the market made from a variety of materials. Human hair extensions are the only kind that are actually made of a natural human product. These kinds of hair extensions often blend in with the wearer's own hair better than extensions made from synthetic materials. For this reason, human hair are more expensive than synthetic hair.So i will teach you how to distinguish human hair and synthetic hair. Visual effect.All natural hair colors are the result of two types of hair pigments.So the human hair as real and natural as possible.synthetic hair made from various synthetic fibers,So synthetic hair looks like the color is bright. Burning effect.human hair has natural protein . It is easy to tell by burning and smell : human hair will be ash , which will go away after pinching. 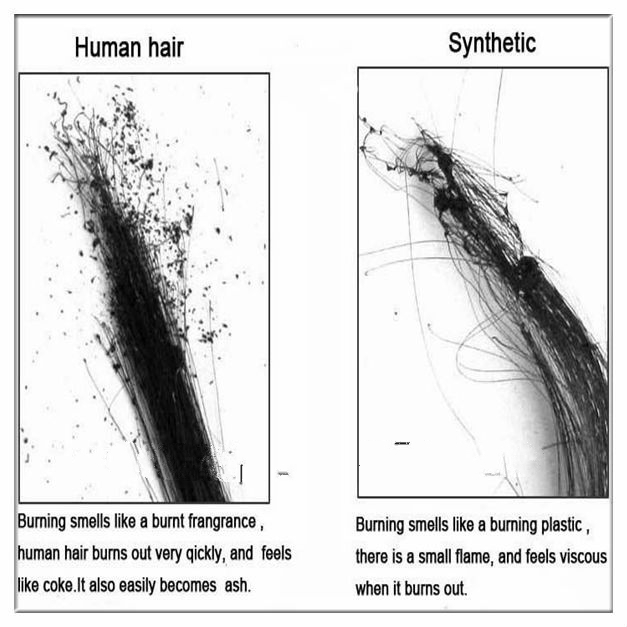 synthetic hair will smell foul . When burning , the human hair will show white smoke. While synthetic hair will be a sticky ball after burning and will show black smoke. Moreover, human hair may have very few gray hair and split ends. It is normal and not a quality problem. Well, Those are my two suggestion.